Ecommerce Conversion rate optimization (CRO) is about detecting where your site isn’t converting well and running experiments to see if you can increase conversion. It uses hypotheses, testing, analytics and user feedback to improve website conversions – which can be anything from turning a visitor into a subscriber… to making a sale… to upselling so you can increase average order value. As the team at Qualaroo puts it: Whatever it is you want your visitors to do, this action is what you are going to measure and what you are looking to optimize. CRO means optimizing not just for a paid sale but for growth overall. …which makes CRO the best thing for ecommerce marketers since the days of easy SEO. This is the beauty of CRO for ecommerce: with very little upfront cost, you can optimize your sales funnel to get more signups, upsells and referrals, creating a snowball effect with impressive, compounding results. It’s the old marketing idea of squeezing everything you can out of what you’ve got. Rather than spending more and more to buy traffic, get more out of your existing traffic. The CRO process generally works like this: learn about your prospects, and test creative based on what you’ve learned. At Friendbuy, we’ve found that using the CRO process to test and implement a referral program can bring your Cost Per Acquisition to less than $10 for every customer (most of our clients hover around a CPA of $3). 1. Collect data (quantitative and qualitative) from your ecommerce store and customers. 2. Gather insights from your research and create hypotheses to test that could increase conversions in your store. 3. Test your educated guesses to get objective results that you can use to improve your store. 4. Evaluate the results of your testing and implement them if your guesses prove correct. Although CRO doesn’t always mean split-testing, running tests (or experiments) is at the core of what makes CRO so appealing today. Technology makes it easier than ever for ecommerce marketers to make a change on a page and see if it’s good for business… or bad for business. So let’s talk about the two primary types of tests you can run on your shop: A/B testing and multivariate testing. The testing of one version of a page or interface element against another version of the same thing. In most cases, 50% of traffic will be sent to each variation. However, if you’re going to test something particularly risky, you may wish to expose that risky variation to a smaller percentage of your traffic, like 25%. Multivariate testing uses the same core mechanism as A/B testing, but compares a higher number of variables, and reveals more information about how these variables interact with one another. So instead of testing two different headlines like you would in an A/B test, MVTs combine a host of variables at the same time. They’re especially useful when testing multiple elements (images, copy, calls to action). For ecommerce shops, you may wish to test multiple elements of a product page at once. Perhaps you’d like to add a free shipping message, try a different headline and suppress reviews for products that have none. Rather than testing one new variation of the page with those 3 changes made to it, you could run an MVT and let your testing platform serve up different combos of the various elements. In the end, you discover which combinations performed best, and you make those part of your new control. But before we can choose which type of experiment makes the most sense for a test, we need to go waaaaay back to the data. That’s where every good test starts. The first step in the ecommerce CRO process is gathering the information you need to make educated guesses about where you can improve your site. This can be done with data from Google Analytics, onsite customer surveys, or (gasp!) actually talking to your customers in real life. For example, Gardener’s Supply Company realized from their analytics they were getting plenty of traffic from their Pinterest page. So to welcome their traffic from Pinterest they created a popup message and special offer for them (does Cialdini’s reciprocity principle ring a bell? ), which ended up increasing their revenue 3x from visitors that came from Pinterest. You can even get demographic info from Google Analytics to see who exactly is clicking to your site and what their interests are to find opportunities for optimization. You can then use that data to drive new tests – and even personalization (a topic we won’t cover here, but one to stay aware of) – that are exposed only to visitors from selected referral sources. To get qualitative data, you have to get your Family Feud on and get feedback from your customers via surveys. What persuaded you to purchase with us? What other options did you consider? What’s one thing that nearly stopped you from buying with us? What was your biggest frustration, challenge or problem in finding our product online? How would you describe our product/service to a colleague or friend? How could we do a better job of persuading your friends or colleagues to choose our product? How would you persuade more people to choose our product? What questions did you have about about our business? What are you hoping to accomplish with our product? When did you realize you needed a product like ours? What was going on in your world that caused you to come looking for our product? What problem would you say our product lessens for you? What two words would you use to describe our product? What was going on in your life that brought you to us today? It’s important to keep your survey questions open ended. After all, isn’t that more work for everyone? Yes, it is – but reading your visitors’ and customers’ words will give you incredible insights into the messages they need to see… messages worth testing. Think about the information you need first… and then only ask questions that will give you exactly that. With Qualaroo, you can add non-intrusive surveys on your site to get really pointed, targeted feedback on whatever you’re wondering about. For example, let’s say the data has shown you that a lot of people are visiting X Product page but conversion for that product is low; if you’re not sure what’s getting in the way for visitors, add a Qualaroo survey to that exact page – so it only pops for visitors on that page – and ask them the question you most want answered: “What 1 thing is keeping you from purchasing this product today?” Listen to what visitors tell you. And use that voice-of-customer data as the basis for an hypothesis for a split-test on that page. You can also get your users’ thoughts about your site in real time with UserTesting. Get real-time feedback as visitors are using your site (sure beats looking over a stranger’s shoulder). Establish where bottlenecks are in your funnel and why users are abandoning their carts. Find dead links and gaps in your site navigation. UserTesting now also offers a service called Peek, which lets you ask visitors on your site if they’ll leave recorded feedback. This is a big improvement to the User Testing service, which previously did not let you get tests from actual users of your site. Though new, Peek is being optimized regularly as a solution – so give it a shot. For example, think of the pages on your site that suffer from high bounce or exit rates. Wouldn’t you like to know what’s going on in the minds of your site users when they leave those pages in particular? Headsets.com saw in their analytics that they had unusually high bounce rates on some of their secondary pages. But they couldn’t figure out why. After telling visitors to simply buy a headset with UserTesting, Headsets.com found most of their customers were misdirected by their site navigation because they didn’t know what headset technology fit their needs. So they set up an A/B test with new navigation that first asked their visitors to decide what type of phone they wanted to plug their headset in to, keeping the old navigation as a control. Their new navigation solved the navigation issue and increased their conversion rate by 10%. This is a great example of why you shouldn’t stop short after gathering analytics data. Using a combination of quantitative and qualitative data will give you the clearest view of what’s not working in your sales funnel and lead you to ask the right questions when it comes to testing your hypotheses. Yes, You Need a Hypothesis. No, It Doesn’t Have to Be Approved by Your Chem 101 Prof. Your experiment hypothesis is an assumption you’re making about what’s gone wrong and what might set things right. Will adding testimonials to our catalog page help visitors feel that they are not the first to trust us and, thus, increase click-through rates to product pages? Ecommerce retailer ModCloth is a big believer in community and developed it through their selection of vintage and indie women’s clothing and inspired blog. They have a feature on their site that allows their tight-knit community of vintage clothing lovers to vote on what products they think Modcloth ought to sell. After voting, they award the winning styles with a “Be The Buyer” badge. Badges are a powerful symbol of social proof, which is defined by Cialdini simply as people doing what they see other people doing. Since the ModCloth community is influenced by what the others in the tribe like, ModCloth capitalized on the wisdom of their crowd as the styles that carry the “Be The Buyer” badge sell at double the rate of styles without one. In this case, ModCloth might hypothesize that, given the tight knit ModCloth community, good prospects will be more likely to buy when they feel they are doing something in keeping with the goals of the community. This would make for a great test for them – and also for you. As you can see, when we’re trying to increase conversion, we have to get creative. That doesn’t mean clever. That means smart + innovative. Persuasive. We need to tap into deeper motivations to get our prospects to act. One common persuasion principle that ecommerce sites use to optimize their product pages is scarcity. Another principle championed by Cialdini, scarcity helps create a sense of FOMO (Fear of Missing Out) and creates an urgency to buy with visitors. Amazon uses scarcity on their product pages. Orbitz does, too: when selling their flights, they let browsers know exactly how many seats they have left on their discounted flights. Now let’s see how this thinking plays out in a test. Monetate ran a test involving time-based scarcity (or urgency) on product pages. The tested variation added a countdown and urgency messaging near the call to action. This optimization tactic resulted in an average order increase of 0.07% that while seems small, actually generated a million dollars in revenue for their ecommerce store. Importantly, Monetate placed the urgency-inspiring elements near the call to action. Joanna Wiebe of Copy Hackers calls this adding “click triggers.” Click triggers help boost conversions by delighting prospective customers, helping them rise above any objections or fears they have about making a purchase – right at the point of clicking. Joanna ran a click trigger test on our very own site. Variation C beat our control call-to-action button by 34% with 99% confidence. That means we now see 134 signups for every 100 we used to get simply by adding two short lines of copy next to our call-to-action. Now, of course, we’re not in ecommerce. But that doesn’t mean click triggers won’t work for you! It’s a great starting point for a test hypothesis / research question. NatureBox, a healthy snack company, recognized that Super Bowl Sunday is probably the snack-iest day of the year in the US, so they changed their referral box copy to try and capture some of the 114 million people that watched the Super Bowl. When their customers choose to share their purchase, this is the message that millions of people see while they’re checking their social media feeds and email during the game. It turns out NatureBox scored big and created lift in referral visits, proving that you can capitalize on events and change your marketing messages to increase conversions. Optimization never stops. Even if you had 100% of your visitors opt into your list or convert into paying customers, you would still have opportunities to run experiments in your email drip campaign, your sales emails, your PPC ads, your retargeting ads – everywhere. Everything can and should be optimized. Testing on your site is just the lowest hanging fruit for so many ecommerce businesses. The different ways you can test your site are almost limitless. Take for example a referral widget. When retail behemoth Walmart Canada saw that more and more of their ecommerce traffic was coming from tablet devices, they realized their current ecommerce site wasn’t set up for mobile conversions and looked to fix it. Linda Bustos from GetElastic showed how Walmart used CRO to completely revamp their ecommerce site. Walmart had a hunch that the site experience for mobile users was subpar at best. They knew that their site took way too long to load on mobile devices. Walmart knew they they needed to make it as easy as possible for their core customers — moms — to shop from anywhere with their phone or iPad. With the responsive redesign of their site, Walmart was able to increase conversions by 20% on all devices. Even more astounding, mobile orders increased by 98%. This is CRO at its core. It’s all about measurable growth. Walmart was one of the first enterprise-level ecommerce retailers to embrace CRO principles and they reaped some crazy benefits while becoming an industry leader in ecommerce sales. Take a look at another big CRO win from GetElastic. GetElastic was tasked with improving conversions for the Official Vancouver Olympics ecommerce store . . . no small feat. See how everything a Winter Olympics fanatic needed to fill out was right in front of them on one page? GetElastic split test both the single-page and two-page checkout processes. The single-page checkout increased paid conversions by 21.8%! Would you believe me if I told you one of these buttons was worth $300 million more than the other? It’s true. According to Jared Spool, by simply changing the Register button to Continue for an ecommerce retailer, he was able to to increase their conversion rate by 45% and extra purchases that resulted in an extra $15 million in the first month. In the first year, the large ecommerce site saw an additional $300 million in revenue. There are small changes like this you can test all over your site to increase revenue – don’t hesitate to start digging for clues in the first phase of your CRO process. After their research found that new visitors of the South American flower delivery shop daFlores often had never heard of the company, Conversion Rate Experts replaced a rotating banner that showed customer testimonials with a static image that read, “Thanks to our 600,000+ Facebook fans” in Spanish. By emphasizing the fact that over 600,000 liked them on Facebook they were able to impress their new visitors who may not have heard of them. That one simple change caused a 44% lift in paid conversions for the online florist. 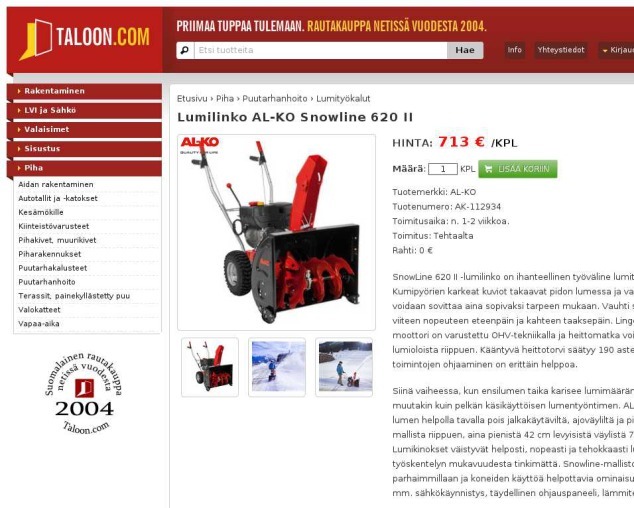 Taloon.com, a Finnish based hardware ecommerce store wanted to increase conversions on their product pages and started doing some A/B tests to find a way in improve sales. As you can see, the social sharing buttons shares were at zero, defeating the purpose of having them there in the first place! If anything, visitors were less trusting of the store because no one was sharing their products. 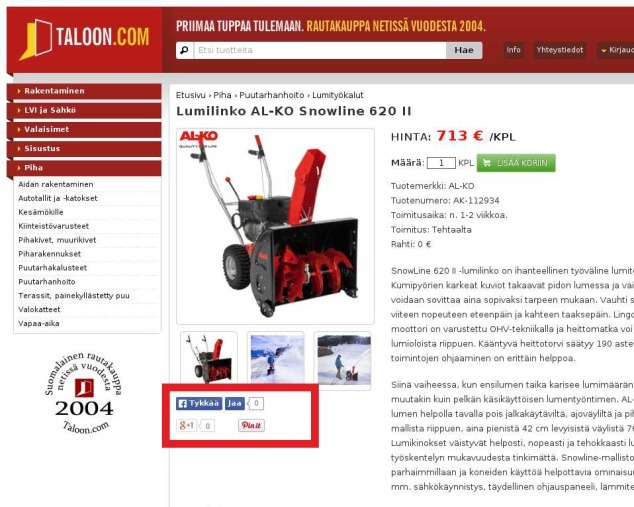 By simply removing the social sharing buttons, conversions on Taloon’s product pages increased by 11.9! This goes to show that just because everyone is using a tactic, it doesn’t mean you should follow. Every store is different and you have to go through the CRO process we described above to find out what works for you. Who knows, maybe pulling elements from your site will result in increased conversions like Taloon. For ecommerce sites, “conversions” are generally paid conversions, and you’re most likely to measure the success of your copy, design and experience on whether you got more sales and/or higher average order values. That said, ecommerce sites are increasingly trying to capture leads for email marketing and social marketing purposes. There are huge optimization opportunities in lead capturing and nurturing. If you’re investing in CRO, you should also be investing in widening your funnel with more leads and turning those leads into paying customers via split-test emails. Think of all your visitors. Now think of your conversion rate. Now think of how you could increase your conversion rate by getting contact information from another 10 or 20% of your visitors – think of the marketing opportunities! That’s growth hacking, and that’s a big part of CRO. As you can see, CRO isn’t just about split-testing elements on your page. It’s about doing more to get more out of every visitor who arrives on your site.